Not long after restoring the lighting in the Clock Tower it became apparent that the four clock facings were losing time at different rates. Since they are operated by one master controller installed in 2007, it was determined that the four individual clock motors driving the clock hands were severely affected by the high heat and condensation levels at the top of the Tower. For the previous almost ninety years, the clocks were operated by a set of massive gears with thick German milk glass clock faces which had made them impervious to these conditions. To address the issues, a non-mechanical thermodynamic ventilation system similar to home attic ventilation systems has been installed utilizing inconspicuous louvered vents. This summer the Verdin Company will replace the clock motors involving the use of a 125′ boom lift. Total cost of this replacement work is $10,000. 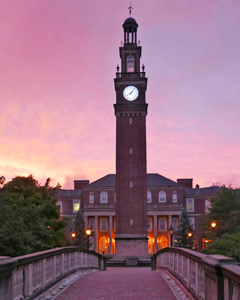 By the start of 99th school year, Withrow’s Clock Tower will accurately shine again. YOUR support of any amount is greatly appreciated. The Alumni Association’s ability to be actively engaged in supporting Withrow’s students and the administration/staff would be impossible if it were not for YOU and other Withrow Alumni. Since the incorporation of the Alumni Assn. 22 years ago, over 2,500 Alumni have made donations in support of it’s mission of striving to be a supportive partner in promoting “a healthy learning environment that helps prepare students to become successful, productive and contributing members of society.” We are deeply appreciative of the support of all Alumni and especially indebted to the 563 Alumni whose faithful support (donating five or more times) truly sustains our efforts. For more informatino on donors or to help us with our work visit withrowalumni.org. We thank you for your support.